WAREHAM, Mass. – Southcoast Health today announced that it received the Defect-free Care Award from the Paul Coverdell National Acute Stroke Program at the Massachusetts Department of Public Health (DPH) for its exceptional care of stroke patients at Tobey Hospital. ‘This award is just one example of the high quality of care delivered by our expert team of emergency nurses and physicians. It gives me great pride to provide excellent service and care close to home. Patients and families don’t have to choose larger hospitals or even the hassle of traveling to Boston. Individuals can safely chose the local hospital in Wareham and know that they are getting some of the best care around,” said David McGinnis, MD, Chairman of Tobey Hospital Emergency Department. The Coverdell Defect-free Care Award recognizes hospitals that, from the period of January to December 2014, provided defect-free care to 85 percent or more of their stroke patients by utilizing all of the interventions for which each patient was eligible. The number of Coverdell hospitals providing defect-free care to the majority of their patients has increased significantly over the last six years, resulting in many more patients receiving high-quality care. Stroke is the fourth-leading cause of death in the Commonwealth, and a leading cause of adult disability. Immediate assessment and treatment is critical to help improve outcomes. 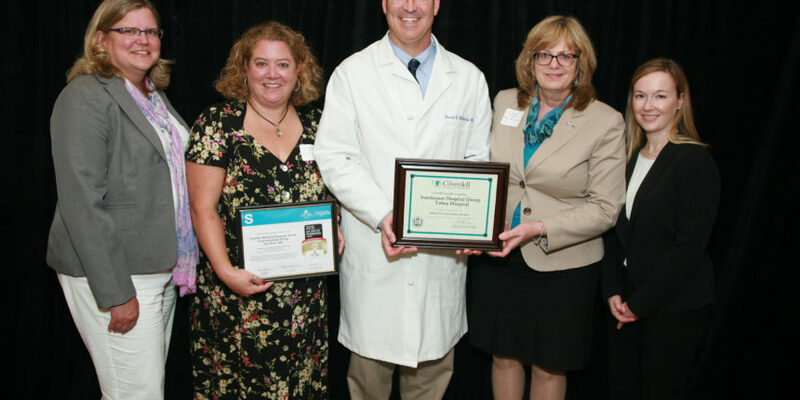 Southcoast Health was also recently recognized for its leading stroke care at Charlton Memorial Hospital with the American Heart Association/American Stroke Association’s Get With The Guidelines-Stroke Gold Plus Quality Achievement Award with Target: Stroke℠ Honor Roll. For more information about the Massachusetts Paul Coverdell National Acute Stroke Registry, or about FAST and the DPH stroke awareness campaign, visit www.mass.gov/dph/heartstroke.